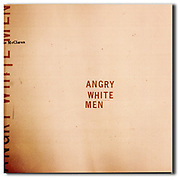 Angry White Men takes it’s title from a phrase used to describe the 1994 mid-term electorate that put Newt Gingrich’s Republican House in power, said to have been motivated by “God, Guns and Gays”. This became the starting point for an investigation of the shifting of the political center point as well as a look into the darker side of extremists and their motivations. In 2004 the entire body of photographs was purchased for the permanent collection of the University Of Oregon Special Collections Library. About this book: "A powerful documentary, employing compelling photography and quotes from the various subjects to explore the shifting of the political center. Cutting edge typography and graphic design by Johnson Wolverton and an introduction by Rene Denfeld."